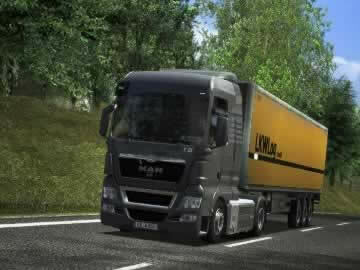 German Truck Simulator Game - Download and Play Free Version! Drive the Beautiful Countryside of Germany and Make Deliveries on Time! Some driving games send you careening through heavy traffic looking to deal as much damage as you can. Others push your reactions to the limit as you slide around hairpin turns at 200 miles per hour. How many put your business skills to the test? German Truck Simulator takes you from the first day of driving a truck all the way through owning your own shipping business as you rise through company ranks and rake in the profits. Take to the streets of Germany and drive through beautiful countryside and sophisticated cities to make deliveries on time, establish branch offices and eventually own your business. Some tycoons start small. In German Truck Simulator, you're a humble truck driver out for your first delivery on the highways and autobahns of Germany. You have but one goal -- make your delivery on time and make a profit doing it. You get to drive through the beautiful vistas of the German countryside while making the trip from city to city. Make enough successful deliveries and you might be able to afford to buy your own truck. Rack up more cash and you can build the foundations of your commercial empire through a series of truck purchases, branch offices and cargo deliveries. As a truck driver, you will spend the majority of your time behind the wheel of your big rig. Every aspect of driving a big truck is there. You have accessible mirrors with all the realistic blind spots of a big truck. You have to signal, follow speed limits and take wide turns to avoid running into other drivers. You have to learn how to reverse with a trailer so you can make your deliveries. The rest is all menu navigating. Once you're able to start opening branch offices and running your own shipping business, you can manage your fleet through menus in your offices. You're still free to make deliveries yourself, and in a truck simulator, the driving is what it's all about. Driving on the German highway system in a big rig is deceptively simple. After all, what more do you have to do that point yourself along a road, hold the gas, avoid traffic and make your deliveries on time? Well, for starters, you have to learn how to reverse and pick up your trailer in the first place. You need to signal your turns and obey traffic laws. If you want to make your run on time, you might need to do some creative driving while passing slower vehicles. Driving simulators appeal to a specific group of gamers. Not many have the patience to sit behind the wheel of a truck for long stretches of time. However, if you're the kind of person who enjoys the more realistic simulation games, you'll love German Truck Simulator. It has everything -- realistic truck handling, authentic German scenery and over 22 cities to visit, each of them modeled on the real buildings and roads of Germany. The key word here is realism. Fans of real simulation will love German Truck Simulator. It's almost like visiting Germany from home. Of course, all is not simply driving. You must obey the rules of the road, or risk being pulled over by the police. What's more, you have to manage yourself as well as your truck. Drivers get hungry and drivers grow tired, and you have to handle those needs just like a real truck driver. German Truck Simulator offers over 22 different cities to start and end your routes in, ranging through Germany and (after patching) Austria. You are able to drive one of seven different models of trucks, including the licensed MAN brand and six unlicensed reflections of real life trucks. You can even choose among over sixty different types of cargo, from liquid containers to box trucks with groceries to wide load flat beds hauling construction material. Four new cities were added in the free Austria patch in late 2010. In addition to the base cities, you are able to select Salzburg, Innsbruck, Vienna and Linz as destinations. That's not all, however. The Austria patch added fixes for several inconvenient bugs in the game, as well as updated graphics all across the board. In a welcome addition, you are even able to import your own MP3 music, or link to a streaming Internet radio service for your on the road entertainment. You're no longer limited to the included sounds the game!